Small lymphoceles (<100 mL) lying near the renal hilum, or lateroposterior, lateroinferior, or inferomedial lymphoceles are the most difficult to drain laparoscopically. If laparoscopic experience is limited, other modalities for drainage should be employed. Significant bleeding is a rare complication of the laparoscopic marsupialization of lymphocele. If dissection occurs near the transplanted ureter, indigo carmine can be given intravenously to confirm the integrity of the ureter. decompress the bladder and stomach, respectively. In the absence of a previous midline scar, access and insufflation are accomplished with a Veress needle using conventional laparoscopic techniques. Once pneumoperitoneum has been achieved, a 3-trocar transperitoneal approach is used. 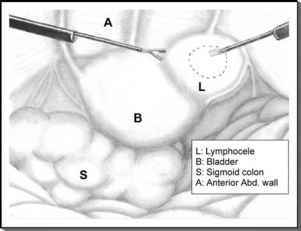 The placement of trocars is similar to a laparoscopic pelvic lymph node dissection (Fig. 1). A 12-mm trocar is placed for use by the camera along with an additional 12-mm trocar for potential use of a clip applier. A 5-mm trocar is placed for laparoscopic instruments. The peritoneal cavity is inspected for adhesions. Careful attention should be paid to check whether the adhesions will complicate marsupialization of the lymphocele and potential mobilization of the omentum. Identification and extent of the lesion may be facilitated by a percutaneous needle or catheter placed into the lymphocele either by preoperative or intraoperative ultrasound guidance. Often the lymphocele appears as a blue-tinged dome protruding into the peritoneal cavity. In patients who have undergone renal transplantation care should be taken to identify the ureter as well as the renal vessels. After complete visualization, the wall of the lymphocele is grasped and the cavity is opened using electrocautery scissors (Fig. 2). Lymphoceles typically contain straw-colored fluid, which may exude upon opening. The interior of the lymphocele should be aspirated with the irrigator-aspirator after opening. A large window from the peritoneal cavity into the interior of the lymphocele should be created by incision. Inspection of the lymphocele cavity is followed by gentle irrigation with an antibiotic solution. Pathologic analysis should be performed on the excised portion of the lymphocele. If needed, hemostasis can be achieved through the use of electrocautery or the application of titanium clips. The patency of the peritoneal window can be maintained by the placement of a pedicle flap of omentum into the cavity. The pedicle flap should be secured with titanium clips to prevent closure of the window and also bowel herni-ation through the peritoneal opening. A permanent peritoneal dialysis catheter can be placed in lieu of omentum in recurrent lymphoceles, those with limited peritoneal openings or those that are anatomically difficult to access. Similar to omentoplasty, peritoneal dialysis catheters must be fixed to the lymphocele wall to prevent migration. They are, however, contraindicated in those lymphoceles that are infected (20) As with any laparoscopic procedure, careful inspection for hemostasis is critical. Following hemostasis, the pneumoperitoneum is released. The larger trocar sites (>5 mm) are closed with a fascial suture and steri-strips are applied over the incisions. 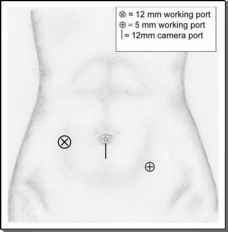 FIGURE 1 ■ Trocar placement for right pelvic lymphocele marsupialization. To perform left sided FIGURE2 ■ Laparoscopic marsupialization of a right-sided marsupialization, use mirror image of this trocar lymphocele. Scissors are depicted in surgeon's right hand, configuration. grasper in the left hand. Dotted line depicts peritoneal window. dioxide insufflation. Diaphragmatic irritation will resolve as the carbon dioxide is reabsorbed by the peritoneum. Patients are given a liquid diet immediately. Hospital discharge typically occurs on the first or second postoperative day. Lymphocele resolution is confirmed with a postoperative computed tomography scan.